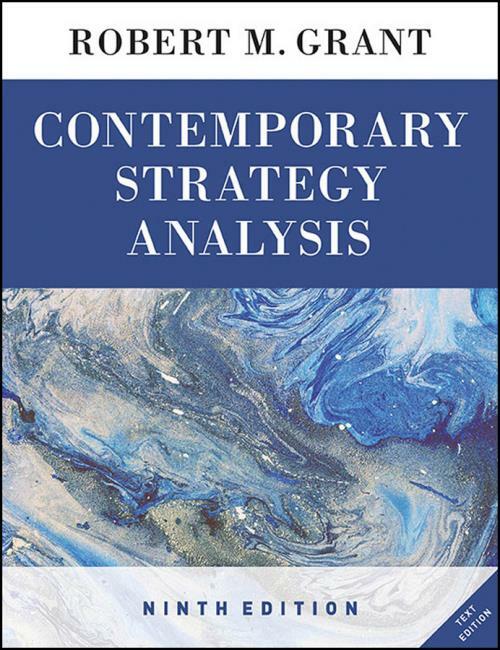 Contemporary Strategy Analysis, 9th edition, is the latest installment of Robert M. Grant’s widely adopted and internationally acclaimed book on strategy analysis in a business context. An ideal study companion for MBA and advanced undergraduate courses, Grant employs his vibrant and accessible writing style to introduce the core concepts and principles of strategy analysis, whilst combining a rigorous approach to business strategy with highly relevant illustrations of current practice. The rich collection of contemporary examples which run throughout the book present an in–depth focus on strategy implementation, particularly the pressures on companies to reconcile scale economies with entrepreneurial flexibility, innovation with cost–efficiency and globalization with local responsiveness. The 9th edition is fully revised and updated to include greater emphasis on strategy implementation, platform–based competition and industry “ecosystems”, the role of strategy–making processes and practices, and mergers, acquisitions and alliances.